We've had quite a few enquiries over the past week or so asking where all of the great video content that was generated for this Cup can be found. The good news is - it's all still available. First, check out our livestream page, where you'll find all of the press conferences the team put on, as well as the dockout and morning shows. This video library page organises all of the livestream videos, by type. Next up, take a look at the team YouTube page. All of the great work by John Von and Rick Deppe and co. can be found here. This includes the build up the Cup, features from during the week of racing, and post-Cup events, like the 'Victory Tour' in California. 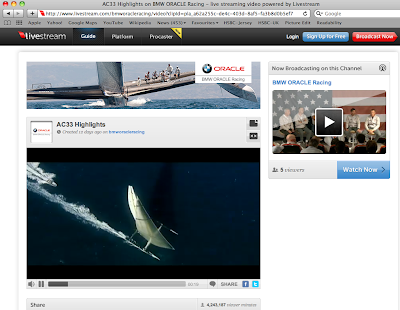 Finally, we have video on the main team website as well, including full replays of the two races of the 33rd America's Cup. 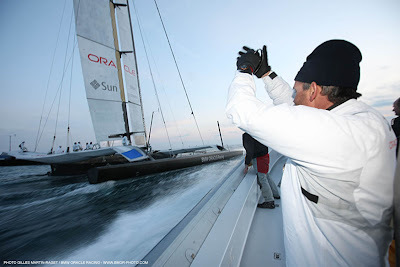 BMW ORACLE Racing turned to 3M riblet technology to reduce drag and increase the speed of USA, its giant trimaran that won the 33rd America's Cup earlier this month. 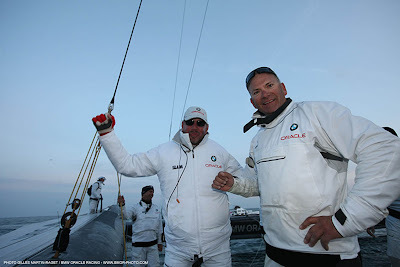 3M supplied BMW ORACLE Racing with an experimental riblet film, custom manufactured for USA, which was powered by the largest wing sail ever built. Similar technology was used by the last US team to successfully challenge for, and win, the Cup - Dennis Conner's Stars & Stripes team which won in 1987 in Fremantle, Australia. In recent editions of the Cup, the technology has been banned under the rules. 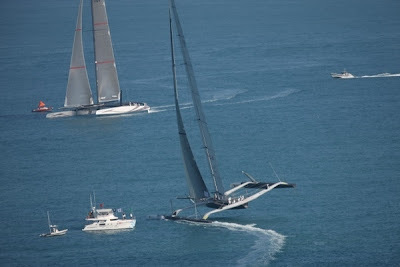 But in a Deed of Gift Match, no such limitation was imposed, and the team turned to 3M to help make its trimaran as fast as possible. 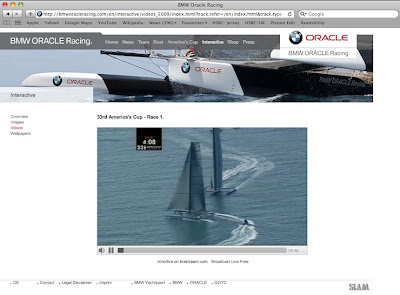 We have full video coverage of Races One and Two of the 33rd America's Cup available for online viewing on the main team website. Click the image below to go to our multimedia video page and relive the excitement of AC 33. 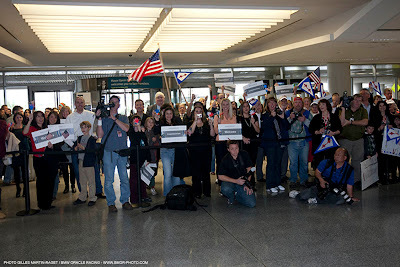 We've wrapped up the California leg of the 'Victory Tour' and many on the team are spreading out via plane, train and automobile for some time with family and friends. Our top video team was on the tour with us, capturing every moment... So if you weren't able to join us in San Francisco or San Diego, here's a taste. The Cup returns to the United States. 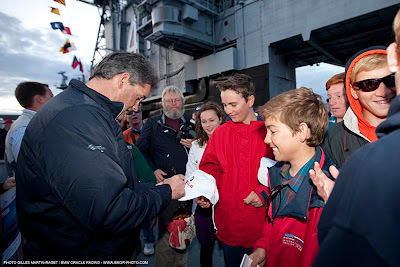 Here's the way Shirley Robertson and the CNN Mainsail crew saw the event. 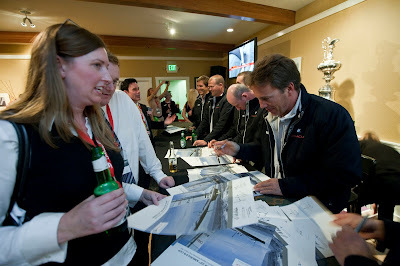 As mentioned earlier, the team enjoyed a fantastic reception in San Diego on Sunday. 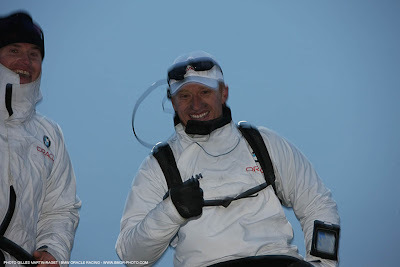 Skipper James Spithill talks about sailing with the wing sail for the first time in San Diego, and draws an enthusiastic response from the home crowd when he says San Diego - where he happens to have a home! - would be a good spot for AC34. 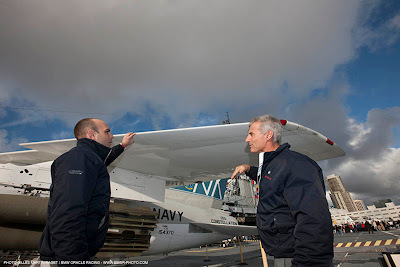 A great reception for the team this afternoon on the USS Midway, with San Diego Mayor Jerry Sanders putting in his bid to be host city for the 34th edition. 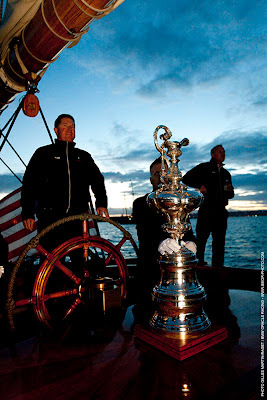 Then the Cup and team travelled to the San Diego Yacht Club on board a replica of the schooner America, for which the trophy is named. The team was honoured to have Cup legend Dennis Conner on board, as he graciously paid tribute to the team. 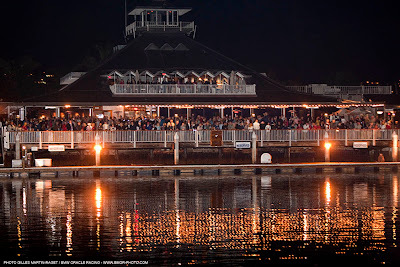 And now, Sunday evening, we're here at the San Diego Yacht Club, enjoying an evening with the club members. 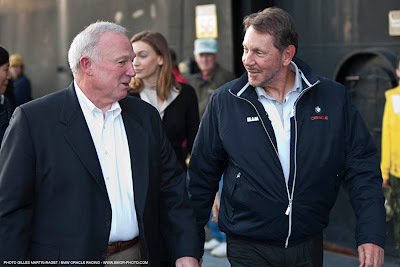 "Your support in the early days of this campaign was essential to helping us get this race on the water with a fair set of rules," team owner Larry Ellison told the club members. 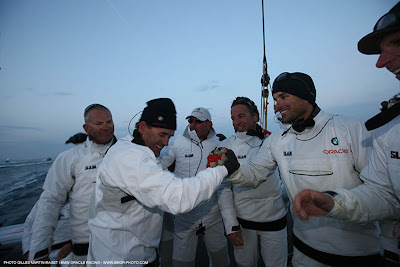 "Without your help, I'm not sure we could have got this race onto the water. Thank-you." What a day! We'll have much more shortly, including all the usual great quality images from GMR. We had some reports the embedded player wasn't loading properly on some machines, so we'll cheat it with a link to the ABC7 site. 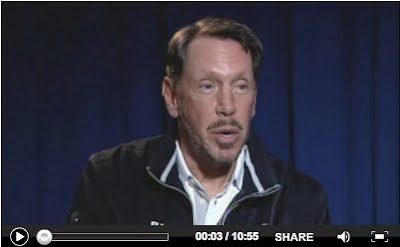 To see what Larry Ellison had to say, click here. 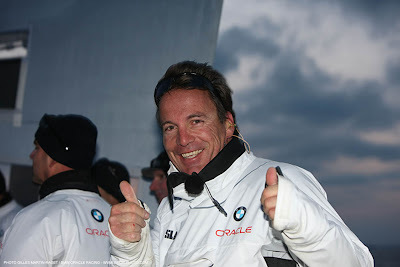 San Diego was the training base for the BMW ORACLE Racing team for about 16 months. The consistent weather and warm welcome the city provided was a big part of the team being so productive in testing sessions leading up our move to Valencia over the Christmas break. Now the team is back. 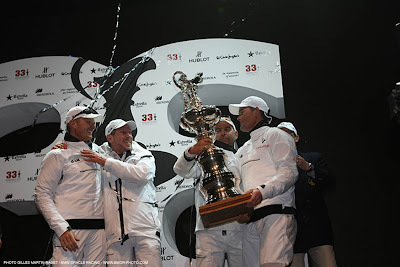 And we've brought the America's Cup with us!! 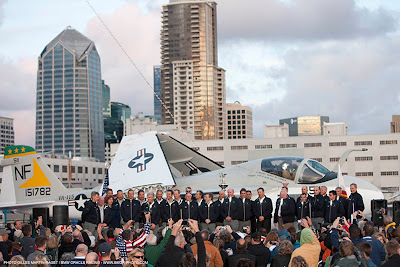 The Cup will be on public display at the USS Midway from 16:00 Sunday afternoon. At 17:00, Mayor Jerry Sanders will host a reception for the team there. We'll have a full report later this evening. 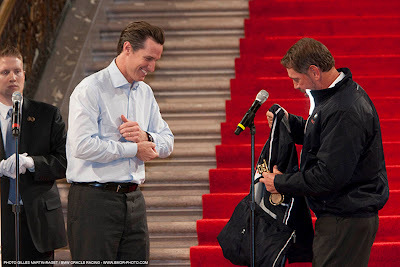 It was a great morning at the San Francisco City Hall on Saturday. 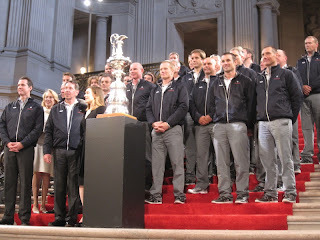 The team was warmly received by a large crowd, who were happy to see the America's Cup back in the United States - and especially in San Francisco. 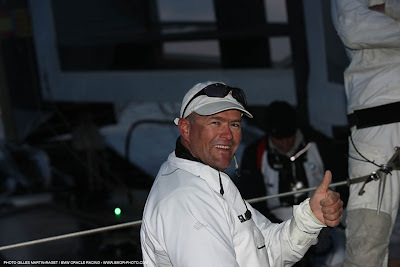 Local hero John Kostecki in a short clip explaining how he'd like to sail the trimaran USA right here in San Francisco. Just a quick note from the event - still happening - at San Francisco town hall. 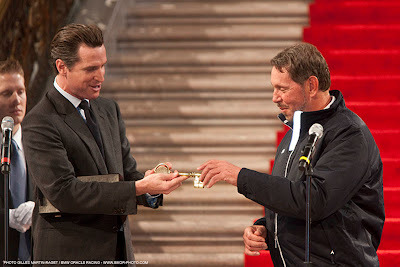 Mayor Gavin Newsom has just presented Larry Ellison and the BMW ORACLE Racing team with a key to the city. 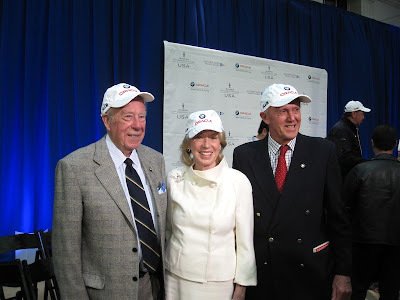 In doing so, Mayor Newsome paid tribute to the characteristics that he thinks would make his city a perfect venue to host the 34th America's Cup. "This is a city of dreamers and doers and entrepreneurs and innovators - a city that has always been on the leading and cutting edge. So it is right and proper that we celebrate this accomplishment and hope that the Defence of this Cup will be right here on San Francisco Bay." The crowd of hundreds on hand erupted in applause. 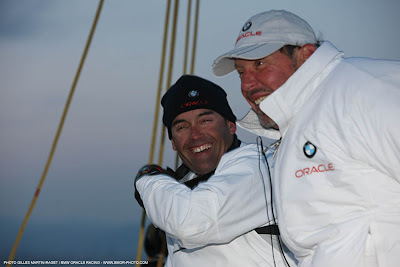 They were equally enthusiastic with Larry Ellison noted: "This has always been my favourite place to sail! Where else in the world can you get 28 knots of wind - every day - guaranteed? 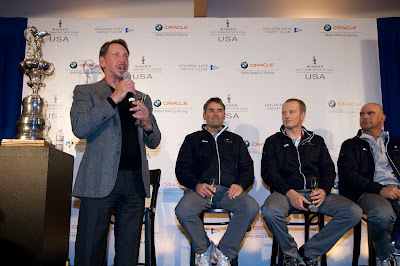 It's a fantastic place to hold a sailboat race, especially the America's Cup." A press conference is scheduled to begin in a few minutes, so we'll have more from San Francisco shortly. 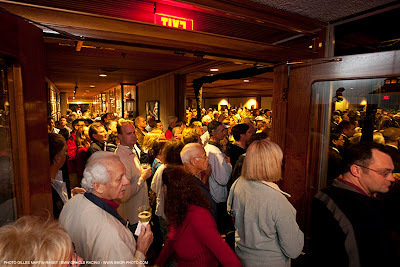 It was a great evening at the Golden Gate Yacht Club on Friday night. 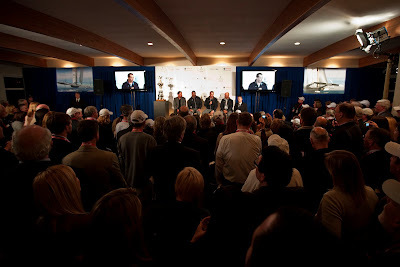 The Club is now just the third US yacht club in 159 years of America's Cup history to hold the Cup, joining the New York Yacht Club and San Diego Yacht Club. 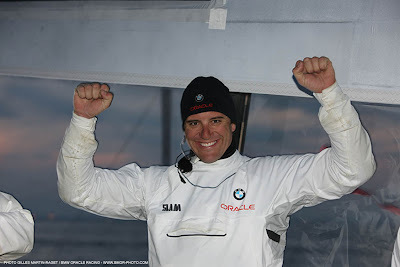 Moderator Tom Ehman introduced skipper Jimmy Spithill as the youngest winning skipper in the history of the Cup. "There's few guys I'd like to mention. 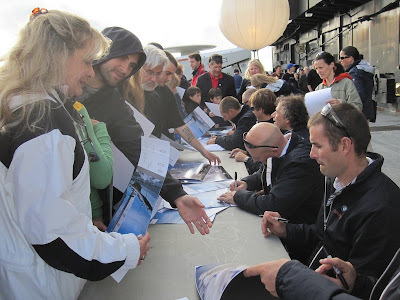 Mark Turner and Tim Smyth and Wolfgang and all the boat builders. We - especially me - used to go out and break the thing, and they'd be the ones who would fix it make sure we could get out there and race." 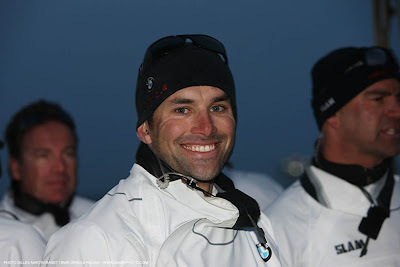 John Kostecki (USA) was introduced by moderator Tom Ehman as the winner of sailing's 'Triple Crown'. 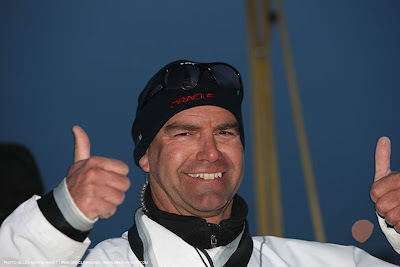 Kostecki is now an Olympic medallist, a winner of the Volvo Ocean Race, and now, the winner of the America's Cup. 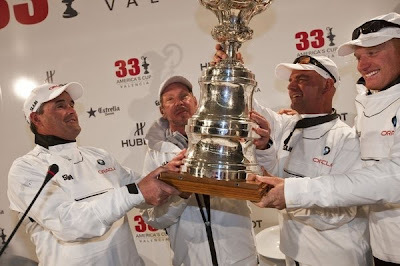 To our knowledge, he's the only sailor in the sport who can claim that trifecta. He's also a local boy, having grown up sailing on the Bay. "It's a very special moment for me to bring the Cup back here to San Francisco and I'm very fortunate to have won this 'triple crown'. 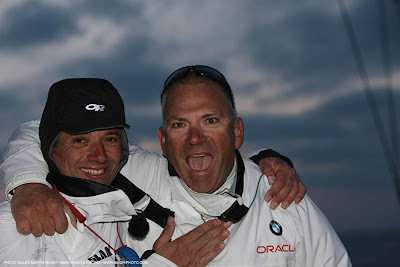 There is one thing in common between all three instances - having a great team. Here, it was the people behind the team who made it possible. So a big thanks to our team. This has been a great experience and hopefully we can repeat it." Mike Drummond, design director, was asked what the top speed of the USA would be. 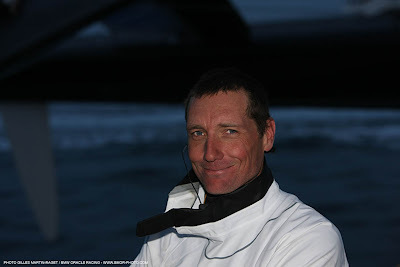 He said while it would be hard to get to 50 knots, he would expect in perfect conditions, you could approach that number. 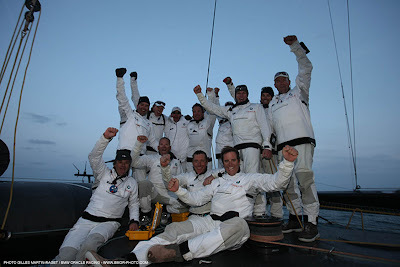 The fastest the USA has been sailed by the team is 42 knots, in about 15 knots of wind. 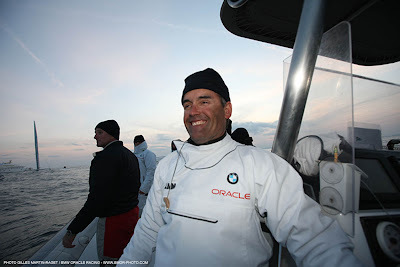 "From my point of view, this was probably the most satisfying of all the America's Cups I've been involved with… Tonight, we've come to San Francisco to celebrate our victory and to share the moment with you." 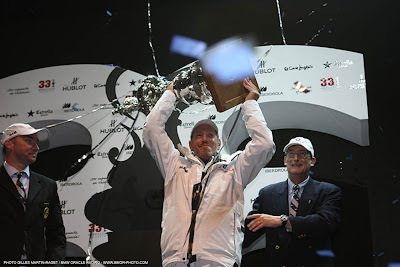 And from Larry Ellison (USA), the founder of the team and a member of the afterguard in the race crew, as he recounted his ten-year quest for the Cup. Afterwards, the guys stayed around to answer questions and sign posters, shirts and hats. 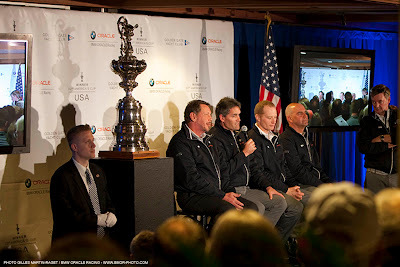 It's been a long day, from the early start in Valencia to a late afternoon arrival in San Francisco and now, the America's Cup arrives at its new home in the Golden Gate Yacht Club. 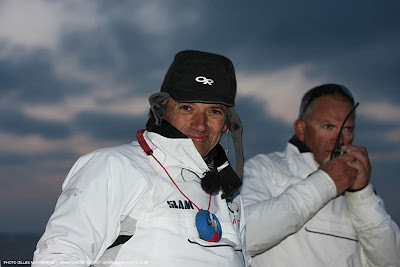 Some shots of the day from Gilles Martin-Raget. It's here! 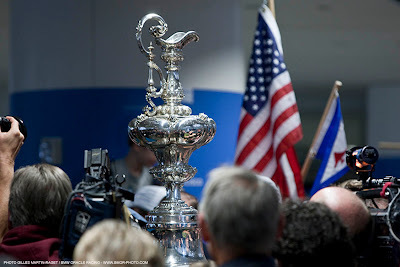 The America's Cup has landed in SFO - despite slightly foggy conditions - and will proceed to it's new home at the Golden Gate Yacht Club for a reception with club members and special guests on Friday evening. 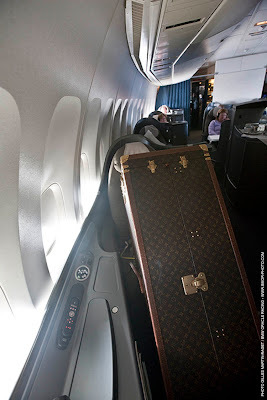 While the trophy held pride of place in its first class seat, it's been a long trip for the people travelling with it. The day started early in Valencia, with an 0600 departure to Frankfurt, via Madrid. 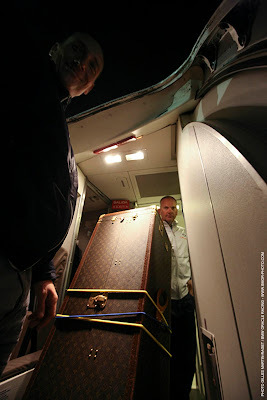 But all the flights left on time, and the Cup arrived in San Francisco on schedule. 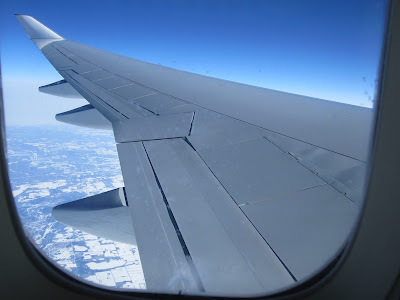 The wing on our 747, less than half the size of the wing sail on USA. 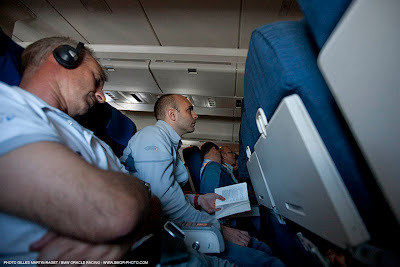 A few bleary eyed passengers at 0600 this morning in VLC - for some, it was due to one final night of celebrations. For others, like Alex Mato, our tour leader, it was due to finishing some last logistics details until the early hours. 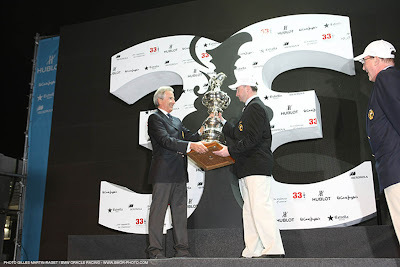 Grant 'Guthrie' Davidson, escorted the America's Cup trophy to the airport and we soon realised a new crew position would be necessary - Cup caddy - and Matty Mason took up the role. Now we're in Frankfurt, on board, waiting for 'wheels up'. The Cup is in its first class seat and we're San Francisco bound. 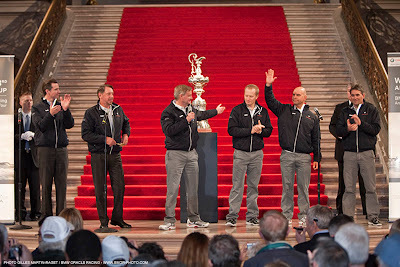 The Cup is coming home to the United States tomorrow (Friday) with San Francisco the first stop on the 'Victory Tour'. 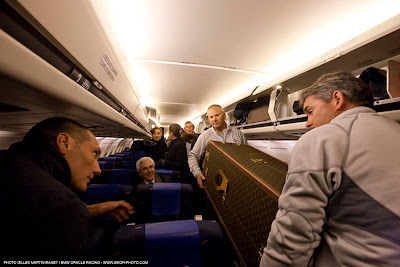 The oldest trophy in international sport is scheduled to touch down at SFO following a flight in a first-class seat Valencia via Frankfurt. 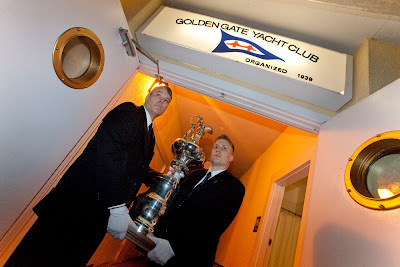 After being welcomed at the airport, the trophy and team will proceed to the Golden Gate Yacht Club – the team’s patron and the Cup’s new home – for a reception with club members and special guests. 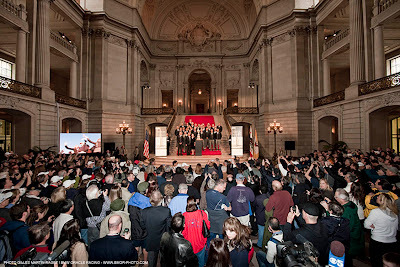 Saturday morning a public viewing is planned at the San Francisco City Hall Rotunda. 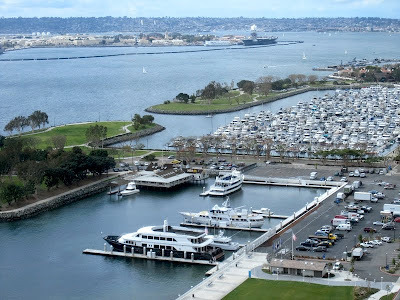 The Cup will then head south to San Diego on Sunday where at 4:00 pm the trophy will be on public display at the USS Midway museum on the city’s waterfront. 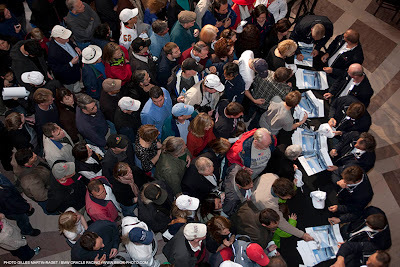 More details are here, and you'll be able to follow the America's Cup on its journey home to the United States right here and on twitter. 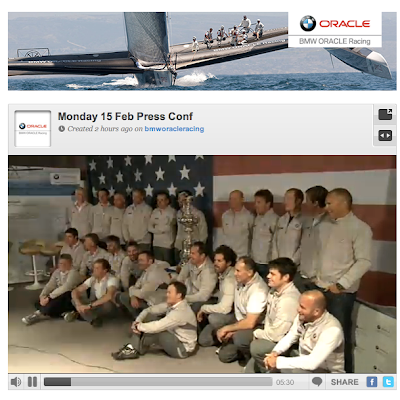 You can watch Monday's press conference - from the BMW ORACLE Racing team base - here... Featuring the entire sailing team, along with representatives from the design and build teams. First leg report - USA takes the lead!